The beloved period film that is still considered one of Robin Williams' best dramatic roles. The story is set in 1959 at the fictitious Welton Academy, an exclusive all male prep school. Sensitive senior Todd Anderson (Ethan Hawke) arrives at the school and becomes friends with his new roommate Neil Perry (Robert Sean Leonard) and Neil's circle of friends. A new English teacher named John Keating arrives into the conservative culture of the school and immediately shakes things up. Keating is passionate about poetry and uses unorthodox methods to inspire his students to be equally passionate, telling them to seize the day and live life to the fullest. As the school year progresses their lives are all affected by Keating's philosophy, with profound consequences as they come into conflict with their parents and school authorities. Also featuring Josh Charles, Dylan Kussman, James Waterston, and Gale Hansen. Directed by acclaimed director Peter Weir, the film's screenplay by Tom Schulman won the Academy Award for Best Original Screenplay. Robin Williams was nominated in the Best Actor category. 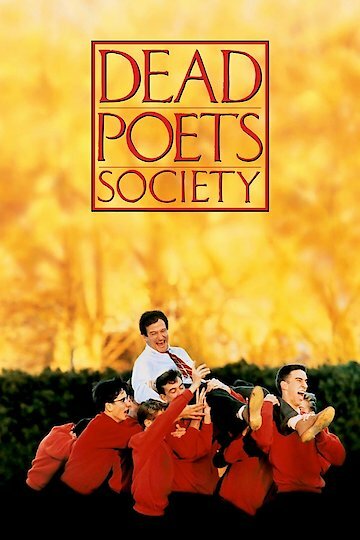 Dead Poets Society is currently available to watch and stream, buy on demand at Amazon, Vudu, Google Play, FandangoNow, iTunes, YouTube VOD online.